Alim Ozturk has signed off from Hearts with a bank of happy memories, a heavy heart and a feeling of bewilderment over his remarkable fall from grace. The towering centre-back brought to an end two-and--half years at Tynecastle when he signed for Turkish second division promotion hopefuls Boluspor on an 18-month contract last weekend. The departure of the Netherlands-born Turk came as little surprise to anyone given his rapid demise from key man and captain to persona non grata under former head coach Robbie Neilson in the early months of this season. 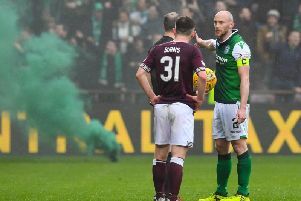 Despite the acrimonious ending to his time at Hearts, Ozturk is able to head to his new club with a positive impression of a stint in Scotland which will be best remembered by supporters for his 40-yard wonder strike in a 1-1 draw away to Hibs in October 2014. “My first two years were excellent,” he told the Evening News. “I had a really good time. I enjoyed Edinburgh and I enjoyed Hearts for two years, and the fans were amazing to me. In my first year, I won the Championship. In the second year, we finished third and I was the captain of the club. That was something special for me, to be captain of a big club like Hearts. It was a really, really proud moment for me. Ozturk had been one of the first names on the team sheet in his first two seasons at Hearts, playing with a sense of leadership that belied the fact he was still in his early 20s and in a foreign land. He made the Scottish Premiership’s team of the year last term after playing his part in a string of clean sheets. With his peak years still ahead of him and obvious potential to continue flourishing, he was viewed as one of Hearts’ most sellable assets, but the three-year contract he signed upon arrival from Trabzonspor in June 2014 was due for expiry this summer. Ozturk, 24, is adamant he was willing to sign a new deal and remains confused by the spectacular manner in which things unravelled for him since the start of this season. “Both sides wanted to sign a contract,” he said. “I wanted to sign and Hearts wanted to sign me. Robbie Neilson told me I was one of his key players and he said ‘I want to keep you for one more year then, if you want to move after that, we will let you go’. They wanted to extend my contract by at least one year, and I was happy with that. We started to talk about everything at the end of last season. I said I wanted to focus on the last few games of the season first, but I told them I would definitely stay so they didn’t need to worry. Ozturk claims the first hint he got that things were about to go haywire for him came in the wake of the Betfred Cup defeat away to St Johnstone in early August. After being suspended for the Premiership opener at home to Celtic, Ozturk was restored to the side for the midweek trip to Perth. Hearts were leading 2-1 and looked all set to progress before a dramatic collapse in the last 15 minutes allowed Saints to claim a 3-2 victory. Neilson was more irate than after any other match in his reign, with Ozturk bearing the brunt in the dressing-room. In what will go down as one of Scottish football’s most mysterious episodes of 2016, the former Cambuur defender never captained the side again and started only two more matches. “At St Andrews in pre-season, me and the gaffer spoke and we had big goals we wanted to achieve,” he said. “I felt I could help the team do that. I played in the Europa League games and everything was fine. It was only after the St Johnstone game that I realised things were not right. “Looking back, I think they were waiting for a reason to get me out the team. I don’t think it’s possible for someone who has had two really good seasons and been the club captain to go out of the team the way I did after one bad game. In my mind, they knew already they didn’t want to keep me, and that was the game. After the game, the gaffer was not happy with me. He was just shouting at me. I still don’t understand why he did that after the game. It was strange. I didn’t say anything back to him, I didn’t give any reaction. It’s impossible that they can say I did anything wrong [in terms of Ozturk’s conduct]. I didn’t do stupid things with Robbie or anybody. Ozturk, who has no problem with current head coach Ian Cathro, claims he is perplexed about why he wasn’t given the chance to sign a contract after he thought he had reached agreement with the club in the summer, and is irked at the manner in which he was banished from the side. “Some people think I didn’t want to sign, but that was not the case,” he insisted. “I was happy there and I wanted to stay at least another year [after this season] because I enjoyed my football there and my first two seasons were the best time of my career. “I’m sad about the way it ended. I didn’t deserve what happened to me at the end. I was always good to everybody. I tried to stay positive, but I’m still asking questions about how it ended. “I don’t feel they were honest with me about the situation. I still don’t know what happened – they didn’t tell me. Maybe they were scared to tell me that they had changed their mind about keeping me. If they told me why it happened, I would accept it, but what they have done to me, I think it lacked respect. I still genuinely don’t know what happened after two great years. “Look at how many clean sheets we had when I was in the team last season. It’s a strange situation. Even after what happened, I started again against Dundee [in October] and we won 2-0 but then I was on the bench again the next week. That was strange because we hadn’t been keeping clean sheets for a few games before that. I can’t understand that situation – it’s impossible. I spoke to the management but what I was told was a bit strange. Eager to get his stalled career back on track as he bids to realise his dream of playing for the Turkish national team, Ozturk jumped at the chance to sign for Boluspor – based in northern Turkey, between Istanbul and Ankara – when it arose last week. Having played a prominent role in Hearts’ rise from the Championship to the upper echelons of the Premiership, Ozturk insists he won’t allow the way it ended to overshadow a predominantly enjoyable time at Tynecastle.